We didn't get a retail package of the Huawei Ascend P1, so our box only contained a compact charger with a USB port and a microUSB cable. There's also supposed to be a headset and some manuals in here too. The Huawei Ascend P1 measures 127.4 x 64.8 x 7.7 mm and weighs 110g, roughly the same as a Samsung Galaxy S II or an HTC One S. It should be noted that the official 7.7mm thickness isn't entirely accurate and, well, ultimately honest. When placed alongside the 8.5mm Galaxy S II you can barely tell the P1 is slimmer, let alone by almost a full millimeter. 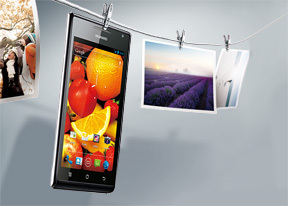 The Huawei Ascend P1 has an attractive angular design that stands out and commands respect. Of the several Huawei smartphone we've handled recently, the Ascend P1 is certainly our favorite. Upon a closer look, the all plastic build has its issues. Fingerprints are a serious one to begin with. The front and rear halves of the body fit together perfectly with no visual gaps. The impression is great but quickly spoiled by the gap around the screen, which doesn't look all that great, not to mention that it gathers dust and grime. The beveled sides optically enhance the phone's slimness. The Huawei Ascend P1 has nearly the same surface as the Galaxy S II but being slightly taller, it doesn't appear as wide. It looks sharper and, in a way, more fit. The Ascend P1 also features a similar subtle chin at the back. The P1 has a 4.3" Super AMOLED screen of qHD resolution. That gives it a pixel density of 256ppi. With the PenTile matrix used, you can see the characteristic crosshatch pattern, but it shouldn't bother most people during regular usage. On the upside, the screen has great contrast, vivid colors and excellent viewing angles. 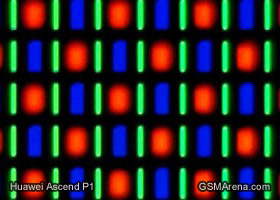 Our measurements show that the screen on the Ascend P1 is as bright as the HTC One X screen and brighter than those of the Galaxy S II and S III droids. You can learn more about the testing process over here. The sunlight legibility is commendable too - our test shows it's slightly better than an iPhone 4S and a bit behind a Samsung Galaxy S II or an HTC One X. We zoomed into the display using our digital microscope so you can get a better idea of how the pixels are arranged, and how big they are. 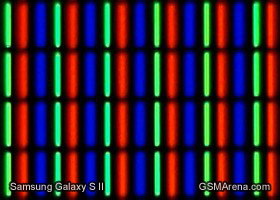 For comparison, we're including a photo of Galaxy S II's pixels as well. Above the screen there's a 1.3MP video call camera (with 720p video recording capabilities), a proximity sensor to disable the screen during calls and an ambient light sensor. Under the display you'll find three capacitive keys for Menu, Home and Back. The phone automatically lights them up in the dark and keeps the backlight off in well-lit conditions. The right side of the Huawei Ascend P1 features the Power/Lock key (Samsung users will feel right at home) and below it is the flap covering the microSD card slot. When you open the flap, you'll also notice a small screw holding the back panel in place - we'll get back to that in a minute. On the left you'll find a comfortable single-piece volume rocker. The top side of the Ascend P1 is quite busy - you get a standard 3.5mm audio jack, an MHL-enabled microUSB port and a covered microSIM card slot. The only item of interest at the bottom is the mic pinhole. The Huawei Ascend P1 has an exchangeable rear cover (you'll need to undo that screw, of course). Huawei is selling various back covers if you want to customize your device. The 8MP camera and dual-LED flash are positioned near the top, sharing a bulging brushed metal plate. It brings the maximum thickness to just over 10.5mm. Actually, we measured the thinnest part of the device and we couldn't find a 7.7mm spot. It's a hair thinner than an 8.5mm-thick Galaxy S II - but certainly not 0.8mm thinner. Off to the side we find the secondary microphone and at the bottom, placed on the chin, is the phone's loudspeaker. The 1670 Li-Ion battery under the hood isn't user replaceable. We didn't find any official battery life ratings for the Ascend P1, but we ran our own tests instead. As expected, the web browsing performance was pretty poor - just 3 hours and 23 minutes. The talk time over 3G was nothing short of impressive though, clocking in at 12 and a half hours and the video playback time is in the upper end of our charts too, 7 hours and 38 minutes. 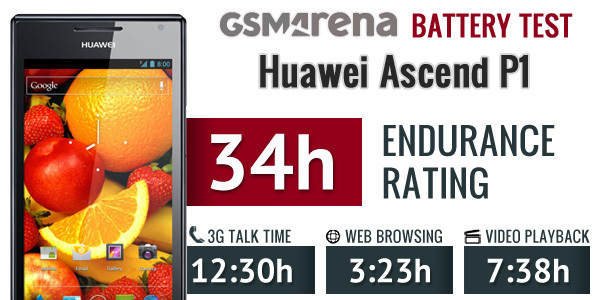 You can read more about Ascend P1's battery life in our blog post. Our endurance rating worked out to 34 hours - it's kept down by the poor web browsing results. If you use a tablet or a laptop for most of your browsing, you should be able to squeeze out a couple of days of usage from the Huawei Ascend P1. Even if it's not as thin as Huawei claims, the Ascend P1 is by no means chubby - it's compact and pocketable and rests comfortably in the hand. The protruding camera helps here as you can use it to prop up the phone with your finger, which is great if the back cover doesn't offer much grip (like the Ceramic White one that we had for this review). The build of the phone feels solid; there is no area of the phone that gives way even if you push down on it hard. You should still take care of the phone tough, the rear cover looks scratch-prone and the phone does rest on its camera. The plastic on the back isn't the best we've seen, but it isn't the worst either. Great job by the Huawei team so far, time to look at how proficient they are when it comes to software. The next page starts off with the user interface and how much (or little) of it has been customized.